Some pediatricians have long-standing policies of not accepting patients who refuse to vaccinate their children. DALLAS (AP) — Dr. Albert Karam knows how important vaccines are for children. He's seen firsthand how immunizations virtually eradicated measles, the disease that made him seriously ill as a child in the 1960s. While sick with measles, he recalled, he screamed and cried whenever someone turned on the lights, and his skin darkened from hemorrhaging. "I never, ever, ever want to see another measles case again," he said last month at a news conference highlighting the importance of immunizing children. Karam's Dallas pediatrics office has a policy of not taking unvaccinated patients. It's something he firmly believes in — he said he can't risk unimmunized children spreading illness to infants too young to have been inoculated. He has had the policy since he started his practice in 1985, he said. Now, he sees more of his peers turning away unvaccinated patients — a policy that gained acceptance by the American Academy of Pediatrics a few years ago. 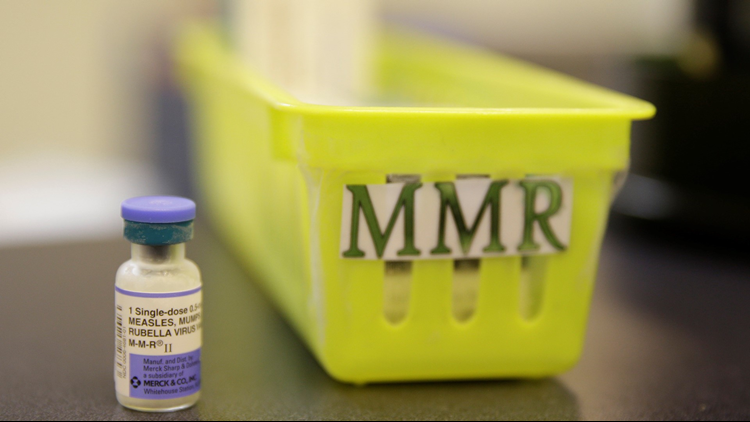 Dallas-area pediatricians tell The Dallas Morning News they've found that more and more parents want to be certain their children won't be in a waiting room with children who haven't had their shots, especially in light of recent measles outbreaks around Texas. The website of Pediatricians of Dallas, where Dr. Chafen Hart practices, includes a strongly worded policy stating that its doctors may ask parents to find a new health care provider if they refuse to vaccinate their children. By not inoculating their children, the policy reads, parents are "taking selfish advantage of thousands of others who do vaccinate their children." Hart said the policy, which has been in place about 10 years, is strongly worded because the office's pediatricians passionately believe that vaccinating children is the right thing to do. She said she believes more doctors are adopting similar policies because "more patients are also demanding that we do." And while ready availability of Pediatricians of Dallas' policy on its website helps vaccine-conscious parents select an office, it also serves as a warning to anti-vaxxers that they're not welcome. Karam said parents who use his practice rarely refuse to vaccinate their child, perhaps because he's gained a reputation as a doctor who won't tolerate it. Plus, the anti-vaccine crowd can easily go online to find lists of doctors who are not "vaccine friendly." Some physicians accept unvaccinated families with an expectation that they'll be able to change their mind over time, said Dr. Jason Terk, a pediatrician with Cook Children's in Keller who is chair of the Texas Medical Association's Council on Legislation. The Texas Medical Association doesn't have a policy on whether doctors should or shouldn't dismiss families that refuse to vaccinate, but Terk said he has had a policy against accepting unimmunized patients for years — "since before it became popular," he joked. "My first duty is to the patients who currently exist in my practice, and I have to be able to provide them with an environment that is safe," he said. Lately, he said, many more prospective patients are asking whether his practice takes unvaccinated patients before they decide to commit to a pediatrician. "The tide is sort of turning toward people who really want practices who they know are going to be safe places to go," he said. Before 2016, the American Academy of Pediatrics discouraged dismissing families that refuse to vaccinate. But that changed after pediatricians spoke out, asking for the academy to support pediatricians who bar unvaccinated patients, said Dr. Sean O'Leary, who serves on the academy's committee on infectious diseases. Now, the American Academy of Pediatrics' official stance is that physicians "may consider dismissal of families who refuse vaccination as an acceptable option," but they shouldn't make that decision lightly or without respecting the parent's point of view. When O'Leary discussed years ago with his colleagues what their policy would be on accepting unvaccinated patients, they decided to allow them at their practice. But that conversation could've gone differently "if we had a bunch of parents in our practice saying, 'I like you guys and all, but if you're going to accept nonvaccinators in your practice ... I'm going to find a practice that doesn't,'" O'Leary said. O'Leary, who along with his colleagues published a 2015 paper examining characteristics of physicians who dismiss families for refusing vaccines, said there can be disagreements among doctors about how to handle these situations. Some doctors, including Karam and Hart, will agree to take on parents who want their child's immunizations to be spread out over a certain period of time. Karam said there's no truth to the idea that the vaccine schedule recommended by medical officials "overwhelms" a child's immune system, but he's willing to work with those parents. "That's not ideal, but it's better than nothing," he said. "I can live with that. We're going to get them vaccinated and safe." Other doctors won't allow departures from the vaccine schedule. Some will only turn away new patients who refuse to immunize, and some will take it a step further and dismiss existing families if they won't vaccinate their children. But some doctors disagree, arguing that what is best for the children is to keep them in the practice, where the pediatrician can ensure they still get proper care and work to persuade the parents to vaccinate their children, O'Leary said. "We don't really know when parents are sort of confronted with this policy," he said. "Do they go ahead and decide to get the child vaccinated, or do they just not end up seeing a pediatrician?" To O'Leary, there's no clear answer on whether physicians should ban unvaccinated patients from their practices. He said he's seen people "in good conscience" make decisions on both sides of the issue. Where does vaccine hesitancy come from? Experts say the anti-vaccine movement began with the publication of a now-discredited study by former doctor Andrew Wakefield that linked the measles, mumps and rubella vaccine with the development of autism in children. The study was retracted in 2010, but the damage had been done, said Dallas County's new health director, Dr. Philip Huang. "There was a good decade — over a decade — of misinformation out there that spread and propagated and magnified," Huang said. Anti-vaccine propaganda spreads easily on social media platforms such as Facebook, where The Atlantic found that seven anti-vax pages were responsible for the spread of 20 percent of the top 10,000 vaccination posts on the platform from January 2016 through February. Pinterest recently cut off search results for the words "vaccine" and "anti-vax" in an effort to stop the spread of misinformation, according to The New York Times. Search for those words on the app, and nothing shows up. When Hart sees vaccine-hesitant parents, particularly those influenced by misinformation they've seen online, she'll often share a story about vaccinating her own children, she said. "I have a little bit of a pedestal I get on, because my oldest is autistic, and when he was diagnosed I had my second child," she said. "I still vaccinated her exactly according to the CDC schedule, because I felt that strongly that vaccines had nothing to do with my son's diagnosis." Hart said she's able to counsel most of those parents and convince them that they should vaccinate. But she deals with the questions constantly. She said every two to three days, she'll interact with a parent who either wants to forgo vaccines entirely or wants to space out vaccinations rather than follow the recommended schedule from the Centers for Disease Control and Prevention. Despite disagreements over vaccines and even disagreements among pediatricians on whether they should treat unimmunized patients, doctors stressed that there's a common goal between physicians and parents: to do the right thing for children. "Pediatricians are doing their best — they went into the specialty to take care of children," O'Leary said. And he said parents, whether they want to space out vaccinations or go without them, truly believe they're doing the right thing for their child. "They're doing it based on misinformation and myths, but they're doing what they think is best," he said. Texas has already seen 11 cases of measles this year, including one in Collin County and one in Denton County. He said we're a "victim of our own success" when it comes to measles. Before the vaccine was developed, 450 to 500 people died every year from the highly contagious disease. After the vaccine, deaths from measles dropped dramatically. Because the vaccine was so effective, there's been a drop in public consciousness of the severity of measles, he said. Huang said Dallas County has room for improvement when it comes to vaccine coverage: 65.6 percent of children in the county are up to date on immunizations, per data from a 2017 survey. That highlights the importance of making sure children get vaccinated, he said. "The consequences can be very severe, and people forget about how severe they used to be," Huang said. Bob Sanborn, president and CEO of Children at Risk, a nonprofit that advocates for children, attributed the return of measles to more kids not being immunized against the disease. When parents pay attention to anti-vaccine misinformation, they're "dead wrong," he said at a news conference in February. "If someone has misled you to say that your children are not safe if they take a vaccine, of course as a parent you want to listen, because you want your children to be safe," Sanborn said. "But what we're here to say is you've been misled if you believe this, and it's your duty as a parent — it's your duty as a Texan, in a sense — not only to immunize your own children, but to make sure that all children are safe," he said.